Introduction: Periprosthetic joint infections (PJI) are increasing as a result of increased major joint arthroplasty (MJA). Classical treatment of PJI is a two-stage revision. However, this approach results in morbidity and is not cost effective. We investigated whether covering of the implants with bone cement is sufficient for eradication of microorganism on biofilm. Materials and Methods: 24 plates were infected by Methicillin-resistant S. aureus (MRSA) in tryptic soy broth (TSB) for biofilm formation for 48 h. They are divided into four groups. Biofilm and living bacteria were shown in first and second groups. Infected implants were covered with bone cement to show eradication of biofilm in third and fourth groups. After implants were covered with bone cement, the bone cement was broken 24 h later, in sterile conditions. Implants were evaluated in terms of bacteria colonies by using the dilutions method. Results: The biofilm was shown in group I by using scanning electron microscopy (SEM). Bacteria colonies were very high in number in group II (3.1 ± 0.3. Mean cfu × 108 ± SEM). Bacteria colonies weren’t identified in groups III and IV (0 ± 0 Mean cfu × 108 ± SEM). There were statistical differences between the group II and group III-IV (P<0.05). There weren’t any statistical differences between groups III -IV (P>0.05). Conclusion: This study shows that, Staphylococci biofilm formation on orthopaedic implants can be eradicated completely by covering the implants with bone cement. PJI may be treated by covered with bone cement without removed implants. PJI is a challenging case among the orthopaedic surgeons although it is seen rarely. Variations of both surgical approach and implants for PJI increase every day. Implant surfaces are rich in serum proteins, which ease bacteria adhesion and accumulation . Bacteria adhered on implants form complex glycocalyx biofilm. Biofilm forms a shield against systemic antibiotics so the treatment of PJI generally fails . For the treatment of PJI treatment, all implants should be removed and long-term antibiotic treatment is required after soft tissue debridement . Temporary antibiotic-loaded spacers should be also filled in. However, removing the implants, which are well fixed in the bone, may cause severe bone mass loss . In addition, if the microorganism is unidentified, systemic antibiotics and spacers can be insufficient for PJI [5,6]. Treatments, which do not require removing the well-fixed implants and which are not specific to microorganism, are required. In our in vitro study, after biofilm formation on the implant surface, we covered the entire surface of it with bone cement and evaluated the effect of bone cement on biofilm producing Staphylococcus aureus. Figure 1: Implant was washed with sterile saline solution (A), then bone cement shell was broken (B, C) for the evaluation of implant. Group I: Positive control of biofilm production. Biofilm formations on implant surfaces in positive control groups were also verified by SEM on a JSM-7001F STEM (JEOL Ltd., Tokyo, Japan). Samples were critical point dried and coated with gold-palladium. Then, implants were evaluated for biofilm production as below. Group II: Positive dry processing survival control group. Six implants not covered with bone cement were put into six new sterile topped containers without any medium or water and incubated for 24 h at 36.5ºC. Then same processes were performed for the counted colonies. Group III: Bone cement-only group. Six implants were covered with bone cement (40 g, Implant cast Germany) (Figure 1B) and were put into the six new sterile topped containers without medium or water, then incubated for 24 h at 36.5ºC. Bone cement was broken under sterile condition at the end of the incubation period (Figure 1C). Implants were put into six new sterile topped containers. Then same processes were performed for the counted colonies. Group IV: Teicoplanin loaded bone cement group. Six plates were covered with bone cement loaded teicoplanin (Targocid 400 mg Sanofi-Avantis Italy). After that, they were put into six new sterile topped containers without medium or water and incubated for 24 h at 36.5ºC. Bone cement shells were broken under sterile condition at the end of the incubation period (Figure 1C). Implants were put into six new sterile topped containers. Then same processes were performed for the counted colonies. Implants were put into sterile, lidded vessels containing 25 mL of a sterile saline solution, and were then vortexes for 3 minutes. The biofilm layer of the bacterial colonies was thus removed from the surface of each sample and converted into a bacterial suspension. To quantify the colonies, serial dilutions (1/10, 1/100, 1/500) were prepared for each sample using the bacterial suspension and additional volumes of steril saline . From these solutions, samples were cultured onto agar-based medium plates containing 5% sheep’s blood, and were then incubated for 48 h. at 36.5ºC and approximately 70% humidity. Bacterial colonies were then counted (Figure 2). In case of no reproduction, an additional incubation of 24 h was done not to miss slow growing colonies. 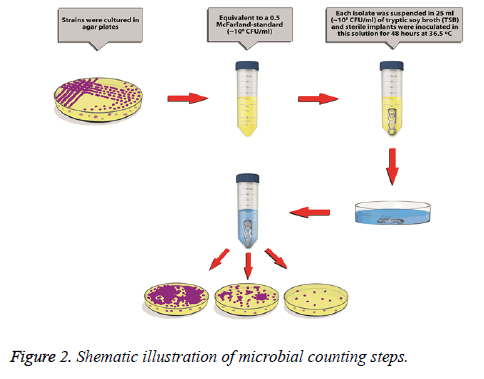 Figure 2: Shematic illustration of microbial counting steps. Data are presented as the mean ± standard deviation (SD). A normality test (Kolmogorov-Smirnov) was performed, followed by one-way ANOVA and a Kruskal-Wallis H-test. P<0.05 was considered to be statistically significant, and all of the statistical analyses were performed using the SPSS statistical software package, version 21 (SPSS Inc., 2012. Chicago, USA). Bacterial colonies count was listed in Table 1. Additional 24 h incubation in the treated groups was shown. No slow growing colony was detected in group III and IV. Significant differences were found between the groups II and III, II and IV whereas there were no statistical differences between the groups III and IV. Bacteria colonies in the groups, which weren’t covered with bone cement, were found very high (p<0.05). Bacteria colonies in the groups, which covered with bone cement, were eradicated totally (Table 1). 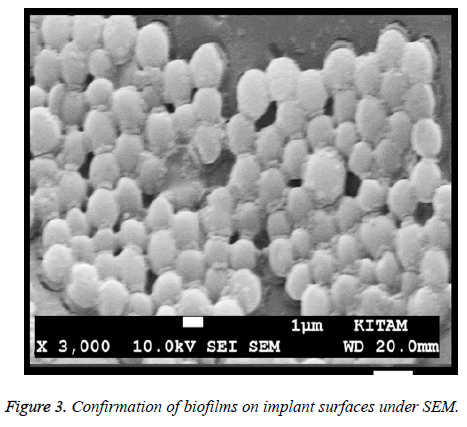 Biofilm formation on implant surface was also confirmed by SEM (Figure 3). Huge number of bacteria can be observed lying over the surface of plates. Table 1: Bacteria colonies count in group II, bacteria colonies counts in group III (effect of bone cement alone) and in group IV (effect of bone cement with teicoplanin). Figure 3: Confirmation of biofilms on implant surfaces under SEM. The biofilm as a pellicle covering the surface of the implants is clearly seen and distinguishable. As the aging population increases, MJA is performed more common due to both fracture and osteoarthritis. Following the MJA, PJI develops with a rate of 0.3-23.7% [3,9]. Host defence mechanisms against bacteria that reach the surgical area in the early period are stimulated and they try to restrain or destroy the bacteria. If they fail, bacteria reproduce faster and form biofilm by adhering to implant surface . The mature biofilm formation protects the bacteria from the defence mechanisms of the body and systemic antibiotics . Thus, in late or chronic PJI, the removal of all the implants and the two stage revision surgery are preferred . Patients, who underwent MJA, generally have comorbid systemic health problems in older age . It is easy to remove the implants and does not cause additional complications, when PJI entirely surround the implant area and cause septic loosening [13,14]. However, bone osteotomy is usually required, which results in additional bone defects if well-fixed implants are removed . These processes increase the duration of surgery and the risk of infection. After the implants are removed completely, antibiotic loaded spacers are generally used. But as a handicap; when these spacers are well-fixed, it may be difficult to remove them, or when they are not well-fixed, they may cause joint stiffness and pain. In order to decrease these drawbacks of two stage revision surgeries, several institutes prefer one stage revision method . However, one stage revision surgery has limited indications and it has higher re-infection risks when compared with two stage revision surgery . A great number of studies are conducted to prevent biofilm formation for prevention of orthopaedic infections and to inhibit the biofilm formation . In some of the studies, the aim is to cover orthopaedic implants with different substances during production and to prevent the formation of biofilm. In their experimental study, Qin et al. showed that silver coated titanium implants decrease the formation of infection . After PJI, there isn’t any study, which shows whether PJI can be treated by covering the implant surface. This is the first experimental study manifesting that surrounding with bone cement on implant surface could eradicate the biofilm. 1. Bone cement gives off high heat while it is hardening. 2. Its tight adhesion to the implant and its effect of isolating the implant from the surrounding tissues could prevent bacteria to generate living and reproducing forms. In our study, the implants were infected in vitro, and then the bacteria and biofilm formations were shown on them by SEM in group I. We investigated the effects of bone cement on bacteria and biofilm formation by covered implants. We suspended each of the groups with bacteria and biofilm in sterile topped containers and observed the changes in their intensity in time. After 24 h, it was observed that biofilm intensity was still high (group II). While the sonication is preferred to indicate the biofilm on the implant in some publications, the vortex method is still used often . In our study, 3 minutes of vortex was preferred to decrease the false negativity. A period of 24 h is enough because of the fast growth ability of the bacteria we used . Nevertheless, in order to decrease the false negativity, the groups without reproduction were followed for an additional 24 h of period. We found that no bacteria biofilm were observed on the implant surface in third and fourth groups. Since hardening of bone cement increases the temperature even up to 90-100ºC, it helps adhering to the implant tightly . We think that the high temperature and tight adhesion of bone cement may cause destruction of the biofilm structure. Since we used MRSA as bacterial strain, implants were covered by teicoplanin loaded bone cement in group IV. The fact that there weren’t any identified bacterial colony in both groups brings to mind that it is because of the heat necrosis of the bone cement and the high pressure during its tight adhesion rather than the antibiotic effect. Although there were no difference between the groups III and IV, antibiotic loaded bone cement in practical applications can be used for its effect against bacteria in bone and soft tissues. We assumed that the implants were well fixed if the implant surface is not totally infected. Thus, in PJI, the available parts of implants could be covered with bone cement, as similar to this method, without removing the implant entirely. For this, the modular and instable components (insert, screw, head, and loose components e.g.) should be removed, then radical soft tissue debridement should be performed. Briefly; the integrity of well-fixed components are maintained, and cost effective approaches can provide short surgery time with low morbidity. The limitations of our study are the lack of dilution test of Teicoplanin and requirements of in vivo studies. Biofilm formations on implant were completely eradicated by being covered with bone cement. PJI may treat by covering the bone cement without removing well fixed implants. Conflict of interest: On behalf of all authors, the corresponding author states that there is no conflict of interest. Statement of human and animal rights: The study protocol was approved by the Institutional Human Ethics Committee of the University. Informed consent: For this type of study informed consent is not required. Gristina AG, Oga M, Webb LX, Hobgood CD. Adherent bacterial colonization in the pathogenesis of osteomyelitis. Science 1985; 228: 990-993. McConoughey SJ, Howlin R, Granger JF, Manring MM, Calhoun JH, Shirtliff M. Biofilms in periprosthetic orthopedic infections. Fut Microbiol 2014; 9: 987-1007. Hoell S, Moeller A, Gosheger G, Hardes J, Dieckmann R, Schulz D. Two-stage revision arthroplasty for periprosthetic joint infections: What is the value of cultures and white cell count in synovial fluid and CRP in serum before second stage reimplantation?. Arch Orthop Trauma Surg 2016; 136: 447-52. Glassman AH. Exposure for revision: total hip replacement. Clin Orthop Relat Res 2004; 39-47. Bedair H, Ting N, Jacovides C, Saxena A, Moric M, Parvizi J. The Mark Coventry Award: diagnosis of early postoperative TKA infection using synovial fluid analysis. Clin Orthopaed and Rel Res 2011; 469: 34-40. Ghanem E, Antoci V, Pulido L, Joshi A, Hozack W, Parvizi J. The use of receiver operating characteristics analysis in determining erythrocyte sedimentation rate and C-reactive protein levels in diagnosing periprosthetic infection prior to revision total hip arthroplasty. Int J of Infect Dis 2009; 13: e444-e449. Mishra SK, Basukala P, Basukala O, Parajuli K, Pokhrel BM, Rijal BP. Detection of biofilm production and antibiotic resistance pattern in clinical isolates from indwelling medical devices. Curr Microbiol 2014; 70: 128-134. Ben-David A, Davidson CE. Estimation method for serial dilution experiments. J Microbiol Methods 2014; 107: 214-21. Anwar H, Strap J, Chen K, Costerton J. Dynamic interactions of biofilms of mucoid Pseudomonas aeruginosa with tobramycin and piperacillin. Antimicrob Agen and Chemother 1992; 36: 1208-1214. Rodríguez-Martínez JM, Pascual A. Antimicrobial resistance in bacterial biofilms. Rev in Med Microbiol 2006; 17: 65-75. Regis D, Sandri A, Rizzo A, Bartolozzi P. A preformed temporary antibiotic-loaded cement spacer for the treatment of destructive septic hip arthritis: a case report. Int J of Infect Dis 2010; 14: e259-e261. Spiegl U, Friederichs J, Patzold R, Militz M, Josten C, Buhren V. Risk factors for failed two-stage procedure after chronic posttraumatic periprosthetic hip infections. Arch Orthop Trauma Surg 2013; 133: 421-8. Panegrossi G, Ceretti M, Papalia M, Casella F, Favetti F. Bone loss management in total knee revision surgery. Int Orthop 2014; 38: 419-427. Lee BJ, Kyung HS, Yoon SD. Two-stage revision for infected total knee arthroplasty: based on autoclaving the recycled femoral component and intraoperative molding using antibiotic-impregnated cement on the tibial side. Clin in Ortho Surg 2015; 7: 310-317. Wilson LJ, Richards CJ, Irvine D, Tillie A, Crawford RW. Risk of periprosthetic femur fracture after anterior cortical bone windowing: A mechanical analysis of short versus long cemented stems in pigs. Acta orthopaedica 2011; 82: 674-678. Ilchmann T, Zimmerli W, Ochsner PE, Kessler B, Zwicky L, Graber P. One-stage revision of infected hip arthroplasty: outcome of 39 consecutive hips. Int Orthopaed 2015: 1-6. Wolf CF, Gu NY, Doctor JN, Manner PA, Leopold SS. Comparison of one and two-stage revision of total hip arthroplasty complicated by infection. The J Bon & Join Surg 2011; 93: 631-639. Gallo J, Holinka M, Moucha CS. Antibacterial surface treatment for orthopaedic implants. Int J Mol Sci 2014; 15: 13849-80. Qin H, Cao H, Zhao Y, Zhu C, Cheng T, Wang Q. In vitro and in vivo anti-biofilm effects of silver nanoparticles immobilized on titanium. Biomat 2014; 35: 9114-9125. Strzelec-Nowak D, Koziol-montewka M, Niedzwiadek J, Bogut A, Blacha J, Mazurkiewicz T. Investigation of the Actual Causes of Hip Joint Implant Loosening Classified as Aseptic-Analysis of Microbiological Culture Results and Levels of Inflammatory Markers. Pol J Microbiol 2015; 64: 129. Lima ALL, Oliveira PR, Carvalho VC, Saconi ES, Cabrita HB, Rodrigues MB. Periprosthetic joint infections. Interdisc Perspect on Infect Dis 2013; 2013. Zago CE, Silva S, Sanita PV, Barbugli PA, Dias CM, Lordello VB. Dynamics of biofilm formation and the interaction between Candida albicans and methicillin-susceptible (MSSA) and resistant Staphylococcus aureus (MRSA). PLoS One 2015; 10: e0123206. Yuliya Y. The Biofilm-forming capacity of staphylococcus aureus from chronic wounds can be useful for determining Wound-Bed Preparation methods. EWMA J 2013; 13: 1. Portillo ME, Salvado M, Trampuz A, Plasencia V, Rodriguez-Villasante M, Sorli L. Sonication versus vortexing of implants for diagnosis of prosthetic joint infection. J Clin Microbiol 2013; 51: 591-594. Vitko NP, Richardson AR. Laboratory maintenance of methicillin-resistant Staphylococcus aureus (MRSA). Curr Protoc Microbiol 2013; 9: 2. Hsieh PH, Tai CL, Liaw JW, Chang YH. Thermal damage potential during hip resurfacing in osteonecrosis of the femoral head: an experimental study. J Orthop Res 2008; 26: 1206-9.